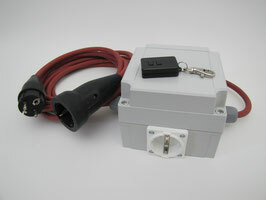 Automatic Suction Switch with a Remote Control - hmh-shops Webseite! The automatic switch does not need any programming and is easy to use. By switching on the power tool, the vacuum cleaner will automatically switch on. By switching off the power tool,the vacuum cleaner will automatically switch off. You can even set a follow-up time up to 120 seconds on the automatic switch. When the vacuum cleaner is used without a power, it can be operated by remote control. Every organ builder has been in this situation: The organ is almost completely installed, and you have rasped some pipes while setting the last stops. As always at the end of the organ assembly, there is less space in the organ, but you still need to work with a vacuum cleaner. You have to work very carefully, in order not to harm the delicate organ pipes. As you move the vacuum cleaner, its long hose can damage the pipes. This problem can be solved with our automatic switch with a remote control! The vacuum cleaner can be plugged into the socket of the automatic switch and be put into a safe distance from the organ pipes. The only tool which you now use to remove dust and chips is the end of a vacuum cleaner hose. With the help of a remote control the vacuum cleaner can be switched on and off. The automatic suction switch has proven itself effective in organ care and is also ideal for working with dust and chip-producing power tools. Power tools can be connected to a coupling and the vacuum cleaner with a socket. Only for suction units without restart lock. Technicals changes in the sense of technical improvements are reserved. Upon request, automatic suction switches can be manufactured, which are supplied with three-phase current and have 2 three-phase outputs or 230 V / 400 V outputs.